40% of households surveyed use Drain Cleaners! 20% of households using Drain Cleaners buy 1-2 containers a yr. 8% buy more than 3 containers a year! Each year approximately 35 million gallons of Drain cleaners go into our water systems from residential homes alone! Approximately 4,000 cases of accidental poisonings by Drain Cleaners are reported each year according to the American Association to Poison Control Centers Toxic Exposure Surveillance System. The ADD-A-TRAP stops this problem before it starts. It installs under the kitchen or bathroom sink on the drain pipe where it can catch debris, hair and jewelry and help prevent clogs deep in your plumbing system. With the ADD-A-TRAP installed under your sink you can feel better knowing that if any debris or expensive jewelry falls down into your drain that it can be easily accessed and cleaned out. Simply unscrew the cleanout screw and pull out the catch tray and you will be able to clean it out. The cost of the ADD-A-TRAP will be paid for the first time you drop expensive jewelry down your drain. Why lose expensive items or unnecessarily risk that your drain will clog? Get an ADD-A-TRAP today. If you have used comparable products and have seen them clog up you should know that it is this very thing that lead us to create the ADD-A-TRAP in the first place. Similar products had a smaller trap area or were otherwise designed to clog up more quickly. 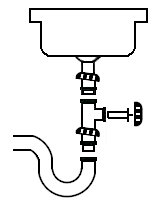 The ADD-A-TRAP was designed to give more filtering area to allow water flow over a greater area of the pipe in order to maximize water flow. This is important and we hope you'll consider our superior design when making a purchase. Thank you.